A couple weeks ago, I posted a Lacy Halloween Wreath tutorial in an effort to class up Halloween. Here is another little decor item that I came up with. Granted, it could really be more of a fall item then specifically Halloween, but if you were to use orange yarn and black filling or vice versa, then it would be more Halloween. Especially if you added some great spider webs or some creepy crawlies. So, the inspiration for this little ditty, came from a doily pattern I found using the pineapple stitch. I had to modify the pattern quite a bit to make the shape I was looking for, but it was totally worth it. This pumpkin is crocheted in the round, starting with the stem. I haven't had a chance to test the pattern, so if you find mistakes, please let me know via email at kitscrafts2012@gmail.com. 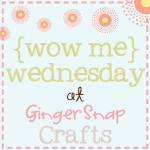 Also, I would love to show off your finished product as well as provide links to your website/blog. 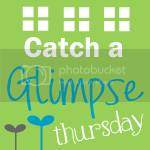 Email me with your photos/info and I will gladly post them! *Stuff your pumpkin at this point. I used some black tulle, but you could use basic fiber fil or fabric scraps or whatever, just keep in mind that you will be able to see the filling. Round 14: CH5, *SK(dc, ch2, dc2) DC in next dc, CH2, repeat from * 4X, SL in 3rd ch of original ch5, fasten off leaving about a 3 foot tail. Thread the yarn needle with the 3' tail, then push the needle up through the middle of the pumpkin and then around one of the sides and back into the pumpkin. This exaggerates the pumpkin shape. Continue doing this until all of the indents are created, there should be 6. CH to desired length, SC2 in the 2nd ch from the hook, *SC3 in the next ch, SC2 in the next ch, repeat from * until you reach the end of the ch, fasten off, leaving a tail long enough to sew to pumpkin. For the leaf, I modified a pattern I found on Pinterest. The original seemed a little large and was in another language, but the method is good. The picture below is from that same source and, although it is of the bigger leaf, the picture illustrates how you will crochet the leaf. Row 19: SC in the next 4 scs, SC2 in the ch1 sp, SC in the next sc, SL in the next sc and fasten off leaving a long enough tail to sew the leaf to the pumpkin. ****I wrote the leaf pattern after I had made it, instead of while I was making it and haven't had a chance to really test the leaf, so if you see issues PLEASE email me at kitscrafts2012@gmail.com. THANK YOU!!! This is one of those desserts that will never win a beauty award, but it sure tastes great. The best part is how easy it is to make. Aside from slicing up some peaches, it is basically a dump and refrigerate recipe. In a medium bowl, combine milk, juice and nutmeg. Add peaches, stirring until combined. Pour mixture into pie crust. Let chill in refrigerator for at least 1 hour. Does it get any easier?! Last Christmas, a woman that my mother-in-law visits gave her a bunch of kitchen towels that were embellished with embroidery and crochet motifs. These were then passed around to all of the daughters. When I saw the intricate work that had been done I knew I couldn't use them as just a towel, so I decided to make a dress featuring at least one of them. To make things easy on myself, I bought a pattern Butterick pattern on sale. I made this dress a couple months ago and thought I had taken progress pictures, but I can't find them, so, if I do, I will post them. The only adjustments I made to the pattern was to add sleeves, a sash and of course the decorative towel. To add in the towel, I just cut out the front of the top, then I placed the towel over the cut out piece towel where I wanted the towel to lie and pinned the two together. Then I cut the towel following the outline of the cut piece and basted the two together. I followed the rest of the directions in the pattern, but for the sleeves, I used a tutorial by Shwin & Shwin. I'm sure you have all seen the incredible things you can create with Duck Tape® and right now, with back-to-school in full swing there are TONS of things that Duck Tape® can add to the experience! So when you are perusing the aisles at Walmart getting great deals, don't forget to check out the fabulous assortment of patterns and colors of Duck Tape® to add to your cart. Better yet, just go online to buy Duck Tape at Walmart. 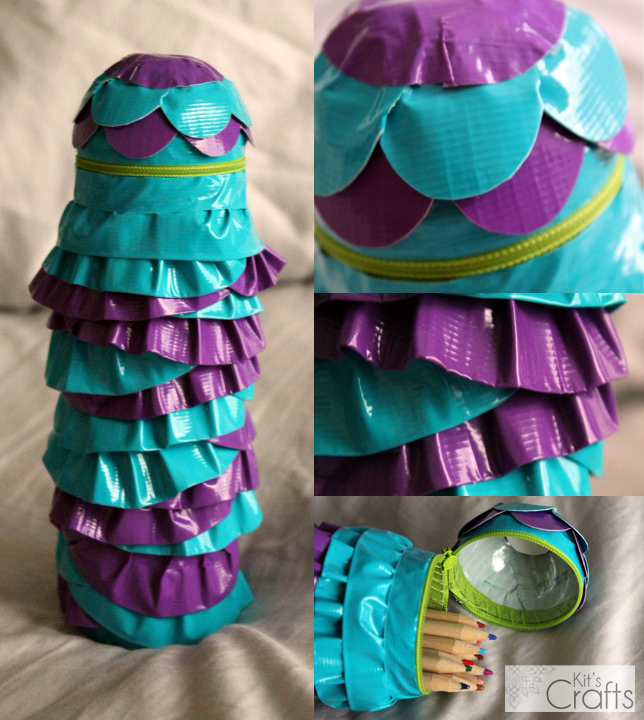 Just to show you an awesome project, I bring you a sweet pencil case created using Duck Tape® and a recycled soda bottle. So the first step in this masterpiece definitely requires adult supervision, but most of the rest can be done by your child, especially the best part, decorating with Duck Tape®. (1 & 2) Heat up your craft knife over the candle for a few seconds, then, holding the bottle over a self healing mat, carefully cut along the base of the mouth opening on the bottle. This will take a few swipes per cut to penetrate the plastic, but it is worth it because the hot knife will melt the plastic as you cut, making the cut more straight and the edges of the bottle not as sharp. (3 & 4) Draw a line with your permanent marker around the top of where the label is and remove the label. Again, heating up the craft knife and holding the bottle over the self healing mat, carefully cut along this line. (5, 6 & 7) Turn your top over onto the cardboard and trace the hole in the top to create a plug. Then, flip the lid over and trace around the base, which will create a base for the pencil case that will help it look less like a bottle. Then cut these circles out. 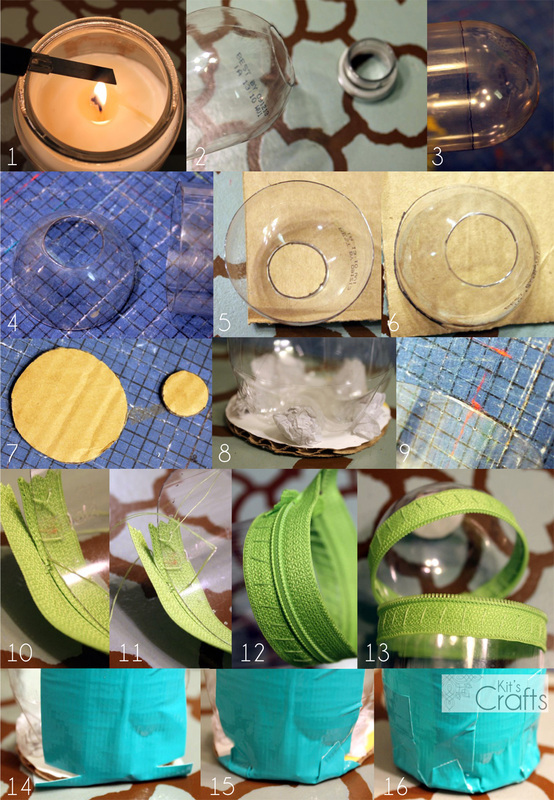 (8) Using the glue gun, plue the smaller circle into the hole in top of the lid. Glue the larger cardboard circle to the bottom of the bottle. Squirt some glue into each of the gaps between the bottle and the cardboard and stuff the tissue or scrap paper inside. (9) Hold the top of the long portion of your bottle lined up against one of the lines on your self healing mat. Take your push pin an poke holes at each of the 1/4" marks, 1/4" from the edge. Do the same along the the bottom of your lid. This is so you can sew your zipper to the bottle. (10, 11, 12 &13) Using your needle and thread, sew the zipper to the outside of the bottle. Start with your needle on the inside of the bottle and go through one of holes you just created, then come back through over the top of the bottle and continue in this method until you make it around the bottle and tie off. Unzip the zipper and follow the same method to attach the other side of the zipper to the lid. 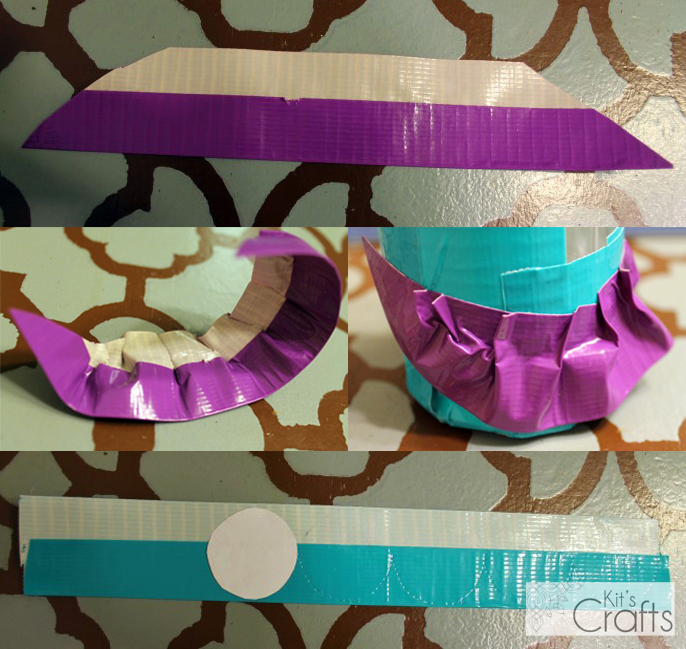 (14, 15 &16) To cover up the bottom, cut a piece of Duck Tape® long enough to cover the bottom and go up at least 1" on both sides. Press the bottom onto the middle of the tape, then press the middle of each side onto the bottle. Make a cut close to the bottom on each side and fold up the flaps. Continue doing this until you have wrapped the whole bottom. Of course you can do whatever you like as the options with Duck Tape® are only limited by your imagination, but I have pictures to show how I did my ruffles and the scallops. So this is just one option amongst the wide range of possibilities Duck Tape® offers. For more projects and inspiration follow @TheDuckBrand on Twitter for tons of tutorials and projects! Truth be told, with the exception of Christmas, I am not the best at decorating for the different holidays. I would like to get better about it and start a collection of things I can put up to celebrate. So, in an effort to do so, I am starting with Halloween. I love the effort that some have made to class up the holiday with lace and things, so I thought it would be fun to add to that effort. Of course, this wreath could just be the base for a ghoulish item for your wall or can even be used for a different holiday entirely. My inspiration for this wreath came from the stiff lace crowns I keep seeing all over Pinterest. I am actually surprised that I didn't find a tutorial for a wreath using the same method. Anyway, just a note about fabric stiffener. I tried using mod podge for this, but it was too flimsy. I know I could have used more coats to stiffen it up, but I was worried about the sheen the glue would leave. I also tried sugar syrup as is used for doilies. Not only was this method ridiculously messy to apply, but it shed like crazy after it dried. It also left a flaky white residue on the lace. So, save yourself some trouble, buck up and buy some fabric stiffener. I promise, you will get MUCH better results. Measure the circumference of your wreath as shown in the picture. Cut a strip of lace at half of this measurement. For example, mine was about 5.5", so I cut a strip at 2.25" wide. *You can use ribbon and not bother with this step, just make sure that the width of your ribbon does not exceed half of this measurement. Next, wrap your wreath form in saran wrap. Dip the lace in stiffener to completely soak. Pull up an end of the lace with one hand and, using the pointer and thumb on your other hand, wring out the excess stiffener. Place the lace on the top half of the wreath, stretching it over the wreath to completely conform to the shape and creating folds where needed so that the strip becomes a circle. Let the wreath dry over night. Before removing your wreath from the form, attach any decorations using a glue gun. When you are ready, turn the wreath over and cut along the back of the saran wrap, then peel the lace from the form. Carefully, peel the saran wrap from the lace and discard. Add a ribbon to your wreath you are good to go! Last July I was lucky enough to sign up and be a package pal to the lovely and talented Anna from 64 Color Box. The event was hosted by Stars & Sunshine and C.R.A.F.T. Basically, the idea is to send a package of crafting goodness to someone who will in turn send you a package of crafting goodness. Perhaps the greatest idea ever! Anyway, I sent Anna Hazel from Colette Patterns, which is a darling dress pattern and I got to make Olliblocks! Go check out the other great packages by clicking the link below!